Come and have a go at brass rubbing. The museum now has four replicas of genuine brasses dating from the 15th century. Each brass has a short history to accompany it. Beneath an ornate canopy, the original brass depicts Thomas Peyton with Margaret Bernard, his first wife and Margaret Francis, his second wife, on either side. 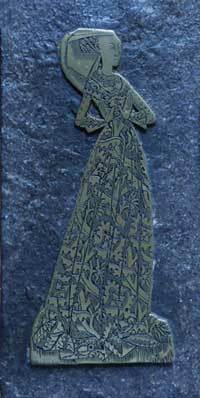 This finely engraved brass shows Margaret wearing a décolleté waisted gown of rich Italian brocade or cut velvet. Her butterfly head-dress, fashionable at that time, is worded with the prayer "Lady (Help) Jhu (Jesu) Mercy". Her elaborate necklace is also worn by Margaret Francis and is thought to be a family heirloom, but research reveals that an identical necklace worn by Isabel Cheyne (Blickling, Norfolk, 1495) and this together with the position of the hands of all three ladies, points to these brasses having come from the same workshop. Sir Ralph was scion of the Whittingham family, who lived in Pendley Manor from the 14th Century. Three generations of Whittingham were named Robert, the first was Sheriff of London in 1419, the second fought in the Hundred Years' War; the third, a Lancastrian, was killed during the Wars of the roses. His daughter Margaret, against his wishes, married the Yorkist, Sir John Verney, whose father, knighted by Edward IV in 1471, became Lord Mayor of London. On Henry VIII's accession, Parliament granted the Whittingham estates to the Verney's. 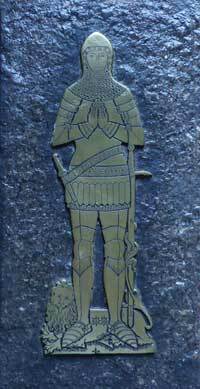 Sir John was buried at Ashridge, as were his son and grandson Ralph, whose brass this is. Ralph and Elizabeth his wife are shown with their 9 sons and 3 daughters. The parents wear heraldic tabards showing the Coat of Arms of the Verneys and Whittinghams. Alice, daughter of Sir Thomas Essex of Lambourne, Berkshire, was the wife of William Hyde; they had five sons and five daughters. 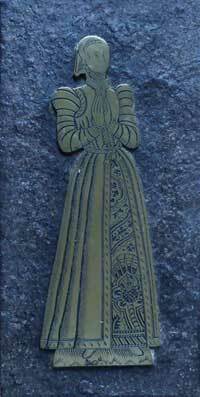 This brass is notable for the elegance of her dress. She wears the Paris hood, known to most as the Mary Queen of Scots head-dress. Alice has a frilled partlet around her neck which later developed into the ruff so typical of Elizabethan fashion. She also wears an embroidered petticoat displayed through the open front of her over-dress. Alice lived during a very eventful period of history - the beginning of the turbulent reign of Henry VIII and the difficult years before Elizabeth I became Queen in 1558. The Wilson brass is unusual because of its incongruity of costume. 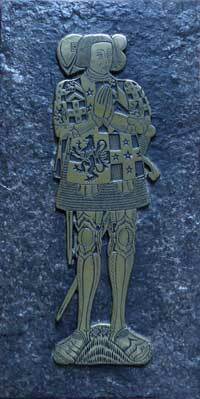 Sir Robert is in the armour of a 15th century Lancastrian knight. He was General of the British Army, and served under Wellington in Napoleonic campaigns. His military career was brilliant if erratic. He held the titles of Knight Grand Cross of the Red Eagle of Prussia, The Military Order of St. Anna of Russia, Commander of the Imperial Military Order of Maria Theresa of Austria, Baron of the Holy Roman Empire, Knight Commander of the Imperial Portuguese Military Order of the Tower and Sword, The Turkish Crescent, and the Military Order of Merit of Saxony. He was Governor and C-in-C of Gibraltar, Colonel of the 15th King's Regiment Light Dragoons, and Member of Parliament for Southwark for fifteen years. Meantime his wife, Dame Jemima raised their thirteen children.